This CTS Knowledge Base article describes the origins of the ash in the diesel particulate filter (DPF). The article provides a summary of the key sources of ash and the effects of those various ash sources on ash properties relevant to DPF cleaning. For most DPFs in on-highway applications with a properly functioning engine, there is only one major source of ash – engine lubricant oil. Figure 1: Ash samples removed from different Diesel Particulate Filters (DPFs) show clear differences in their properties. Specifically, it is only certain additives in the oil that contribute to ash in the DPF. Generally other sources of ash, which contribute to a smaller extent include certain elements in the fuel, engine wear metals, exhaust system corrosion products, and ambient sources. The source of the ash plays a key role in controlling the ash properties, which ultimately affect DPF and engine performance, as well as the ease of ash cleaning. 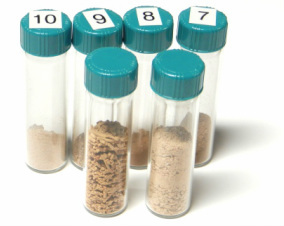 Figure 1 shows several different ash samples. Not only does the ash composition vary between the different samples, but the differences in composition also affect how the ash responds to changes in DPF operating conditions, such as high temperature events. The left vial in the foreground of Figure 1 shows dense, sintered ash, while the vial on the right shows the ash as a loose powder. Understanding differences in both ash chemistry and reactions under exhaust conditions is crucial for effective ash cleaning. Engine Lubricants are typically the single largest source of ash in the DPF. Specifically, it is a small handful of additives in the oil that contribute to the vast majority of the ash. These additives, such as metal-based detergents, anti-wear additives, and ant-oxidants, are required to protect key engine components and were developed long before the introduction of DPFs. As the engine oil is slowly consumed over many thousands of miles or hours of operation, so too are the lubricant additives, which become trapped in the DPF as ash. Due to the large contribution of lubricant additives to DPF ash, new oil specifications were developed (CJ-4 in the United States), which limit the total ash content (sulfated ash) of engine oils used on DPF-equipped vehicles and machinery . Diesel Fuel is consumed at a much higher rate than oil. Even trace levels (1 part-per-million, ppm) of incombustible material in the fuel can lead to high levels of ash in the DPF. Fortunately for nearly all high-quality fuels, this is not the case. Care must be taken, however, with certain alternative fuels, particularly biofuels which have not undergone a detailed inspection or certification process, as traces of sodium and potassium may be left over from the production process and can contribute to ash in the DPF. Similarly, certain aftermarket fuel additives can also contribute to ash, depending on their formulation. Fuel-borne catalysts containing iron, platinum, or cerium, are used in certain cases to promote DPF regeneration, and can lead to high rates of ash build-up in the DPF. In general, however, high-quality commercial fuels contribute very little to ash in the DPF under normal circumstances. Wear Metals and Corrosion Products form a small fraction of the ash found in DPFs, typically less than 10% under most conditions. Wear metals are the result of engine component wear over time. Corrosion products, on the other hand, result primarily from exhaust system corrosion (rust) and are also trapped in the DPF. These types of ash constituents are generally much larger than lubricant-derived ash particles. Environmental Sources can also contribute to ash in the DPF, depending on where the engine or equipment is being operated, as well as the condition of other engine systems. Environments such as mines, drill sites, and other off-highway locations with high concentrations of fine incombustible particles may result in some of these particles making their way through the engine and accumulating in the DPF. The contribution of these environmental sources to DPF ash may be exacerbated by poor maintenance practices, including broken or missing intake air filters. DPF ash is primarily composed of metallic oxides, sulfates, and phosphates, which are directly related to the sources of ash as well as exhaust temperatures experienced by the ash in the particulate filter. The list below identifies the major ash constituents based upon their primary sources. The source of the ash and its elemental composition is important as the composition determines the key ash properties including melting or sintering temperature, density, and crystal structure and particle size. Melting or Sintering Temperature defines the manner in which the ash is affected by high temperature events in the DPF. Although the average exhaust gas temperatures during an active regeneration event range from 550°C to 650°C, local temperature inside the DPF can be much hotter, and in some cases approach 900°C to 1,000°C for short periods of time with high soot loads . These high temperatures are certainly unintended, but can have a profound effect on the residual ash. Effects of high temperature exposure include ash sintering, melting, or decomposition, which is a direct function of the ash composition. In general zinc-based compounds decompose and melt (in some cases) at much lower temperature than calcium- or magnesium-based ash components . The results of even very short-term high temperature exposure are observed in DPFs and affect the resulting ash properties and chemical composition, as well as the degree to which the ash is bonded to the filter surface. Crystal Structure and Particle Size is also dictated by the ash composition, which in turn, affects how the ash deposits agglomerate, grow, and pack in the DPF channels. Whether the ash particles are spherical, elongated, or of a more complex morphology, all affects the characteristics of the resulting ash layer or ash plugs, as well as their ease of removal. Although primarily dictated by the ash chemistry, temperature also plays a role in ash agglomeration and growth, and can have a large impact on influencing the crystal structure of the resulting ash. Density of the individual ash components (intrinsic density) indirectly influences the bulk density or packing density of the aggregated ash in the DPF. The packing density of a material includes voids within the bulk material, the classic example being loose powders, and is an important characteristic of the ash in the DPF. The ash packing density directly impacts ash porosity and its resistance to gas flow, which affects both the degree of flow restriction and exhaust back pressure in operation, as well as the ease of ash cleaning using methods that rely on flow through the ash to remove it. The ash sources and its resulting composition determine the ash properties, which impact how the ash affects DPF and engine performance as well as filter cleaning. Older high oil consumption engines may accumulate ash in the DPF more rapidly than newer low oil consumption engines. Good engine maintenance and operating practices can also help reduce ash build-up from various sources in the DPF in the first place, thereby prolonging the service life of the filter. Sappok, A., Munnis, S., and Wong, V., “Individual and Synergistic Effects of Lubricant Additive Components on Diesel Particulate Filter Ash Accumulation and Performance,” ASME Technical Paper ICES2012-81237, 2012. Sappok, A., Kamp, C. and Wong, V., “Sensitivity Analysis of Ash Packing and Distribution in Diesel Particulate Filters to Transient Changes in Exhaust Conditions,” SAE Int. J. Fuels Lubr. 5(2):2012, doi: 10.4271/2012-01-1093.